Hello dear friend, and thank you for your interest! Who we are? And why you did not hear anything about us before? The story of our project have started in our local country in 2007 year with the meeting of old friends. 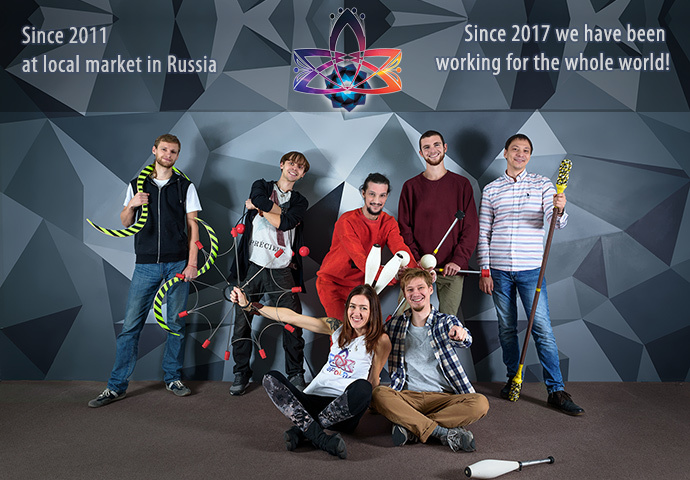 We opened flow art school in 2009, then in 2011 we made work shop with fire props for students and opened the website http://epoi.ru. In the beginning we were reselling great props from HomeOfPoi and FlowToys. Then we have started to produce our first branded led props (poi, staffs and etc.). Our shop was working only with local market for all the years since 2011. We have got lots of experience during all this years and finally are ready to present our products all over the world. Our clients have left plenty positive feedback that is why we are sure in the quality of our props. Many artists from different countries are interested in our products, because they have reasonable price and great quality. Alt the end of 2017 we have started to export it around the world! In 2014 we were the first who developed and integrated into our pixel pois Image Stabilization and a system that tracks the speed of props rotation. The speed of images rendering in our props is up to 4540 rows/second, and it automatically changes depending on how a user spins. At the same time, this speed in other manufacturers' props rarely exceeds 1500-2500 rows/second, which means strong image compression or spreading at different rotation speeds. Also, the images spreading should be adjusted manually. Only in 2018 other manufacturers offered the "similar" function in beta-version. In 2016-2017, we developed a new generation of reliable and affordable props, and an option for beginners - AeroPoi (it is one of the first budget models in which one can create their own modes). Also, at the beginning of 2017, we were the first in the world who presented programmable LED fans and staffs which lighten all along. In 2018 we developed unique cases and designs of the new pixel hoops and fans. Now there are no analogs in the world, which are compatible in the quality of design. We do not use "foam plastic" in our hoops as other world manufacturers, wires are not visible from the outside and batteries are well-hidden. Besides the shatterproof case, our hoops are very convenient for spinning and even allow users adjusting the balance. We have started our Instagram in 2017, our facebook and English website NEOPOI.COM will have been started at summer 2018. MOVIE about our project and experience will coming soon! Our mission? We don’t have any mission! We just like to spin and love to create amazing equipment! We are pleased to know that the artists that use our props are gifting the audience around the world vivid impressions and emotions! This gives us the motivation to work every day, to make our props even better, more functional, more convenient and more reliable! We will be glad to get acquainted with new friends from other countries and hope that our products will be enjoyed by everyone! *In photo: our main team, also many thanks to people who supported us: programmers, theatres, artists, engineers, freelancers and etc.